Instead of complaining about your circumstances, get busy creating new ones. You either suffer the pain of discipline or the pain of regret. I used to call Joe a genius – everyone did. At school we all thought of him as an incredibly “gifted” guitarist and he’s since gone on to travel the world making a very good living at what he loves to do. “I always start the day with two hours of practice and do two more hours in the afternoon or evening. If I didn’t I’d be hopeless,” Joe said. At that moment it hit me: Joe was gifted, but this was a gift that had started out very small, perhaps even invisible to most people, but then he had added, built upon, and massively extended it. Joe had developed his gift through self-discipline. For example, celebrities have never been more visible in our culture. Famous athletes, talented actors and actresses, and incredible musicians are all over the media. But what we don’t see are the thousands of hours of super-focused work these people have put in behind the scenes to get to where they are. It’s easy to feel that success comes easily – that it’s just a matter of luck, or an innate gift. But anyone who has achieved anything has done so because they’ve been able to control and direct their own inner strengths and actions to the extent that has enabled them to become super-skilled at what they do. And this kind of self-discipline, like a muscle, can be developed by all of us, including you. This is one of many principles Angel and I cover in our brand new course, Getting Back to Happy. Getting Back to Happy is the go-to course for anyone serious about taking action to reclaim their happiness and realize their true potential from this moment forward. But since you have to wait until November 4th to enroll in Getting Back to Happy, I want to share a sneak peek with you today guaranteed to help you build your self-discipline, so you can get more of the right things done and achieve more success in life. Set aside a few minutes and check it out. I promise, it will be worth your while. And of course, if you have any questions about Getting Back to Happy, or thoughts about this post/video, leave us a comment below and Angel and I will reply as soon as we can. Also, feel free to share your thoughts with other M&A community members too. Yet another post and video packed with useful advice. Thanks Marc. With the current challenges I face running my family business, this post helps in a big way. I struggle with self-discipline every day – I always get waaaay too comfortable with where I am and what I know, so I don’t push myself to greatness. Reading blogs and books like yours, Tony Robbins’ and others for at least 30 minutes every day has become a ritual of mine that has helped me stay focused and motivated to push past my comfort zone and get the right things done. I look forward to enrolling in your Getting Back to Happy course. It might be just the kick I need to live every day as the best version of me. Many of the tips from your video here resonate with me as useful ideas that I could start putting into action tomorrow morning. I’m going to spend time this evening figuring out what reward substitutions I can create for myself. This is also good advice to pass along to my adult children, as helpful methods for moving forward in life and business. Thank you for this. And I also look forward to hearing more about your new course. As for me at this moment, I really need to focus on your second point in the video by setting up some self-discipline trap doors for myself…whatever it takes to keep me on track. I am often far too lazy and, because of it, I do not get anything productive done. I’m sure many people here can relate. And congrats on launching Getting Back to Happy. I can’t wait to sign up! It’s so important to remember that discipline is an essential ingredient to success and that it’s really up to us and no one else. Thanks for this gentle kick in the right spot. Really resonated with second point in the video. I love the focus of this post! As a musician and writer, I’ve often dealt with the “invisibility” you write about here. Sometimes others’ attitudes can get me down; I don’t like when people assume that my successes are the result of fate or divine intervention. These attitudes lead others to resent my success and negate my efforts. I think it’s important for people to realize that talent will only carry someone so far. Any passion demands daily work. The video was awesome!! Excellent advice from a brand new perspective, that is so usable and made perfect sense. As always, your advice was not something just regurgitated from the standard self-help books. Thank you and I’m looking forward to more. Some very useful realizations in this post! Self-discipline is something most people would benefit from improving, yet so many fail to realize the important role it plays in success. I know I used to make the mistake of thinking that genius was something that some people just had, instead of something you have to work hard on through self-discipline. Fantastic!! I was just thinking about how to motivate myself this morning, so this was very timely for me and really useful. Perfect. Perfect. Perfect. I am disciplined in some areas but others require almost the equivalent of teeth pulling. The good news is, I just figured out from reading the book, This Year I Will, that I work best by taking small steps. That tidbit accompanied by this post equals success. Love the story at the start. The 10,000 hour rule states that you will need this amount of time to become an expert in your field. I worked out that equates to 2 hours 45 mins daily over a 10 year period. No wonder your friend was able to make a living with his guitar! This is a great article and video. Currently I am pregnant and get tired a lot. I know procrastinating a lot is what I have been doing. I know a good physical exercise and eating healthy will help me and my baby but I find myself eating chocolates most of the time and feeling lazy while I need to exercise. I would like to thank you a lot because after watching your video I promised myself that I would do right thing for myself and my baby. Thank You Marc and Angel. Good one … please include some more motivational videos in the future too. -Write down what you want to get done. -Have someone hold you accountable, by simply sharing with them what you want to do. Review what you have done and be proud that you’ve done it! I loved this video. It is very true that self-discipline is something people struggle with a lot! Lately, I’ve been finding that certain things I want to do I have been delaying doing, not because I don’t want to do them, but because I have other things to do, and I have trouble getting myself up when I wanted to in the morning…the alarm clock ideas are pretty funny and worth trying. I already do reward substitution, but I will definitely try to do it more over the next week! It really helps to have a reward after doing something difficult or arduous, or just something boring that you had to get done. I will definitely keep these things in mind, thank you! @Terrence: Love the steps you’ve laid out. 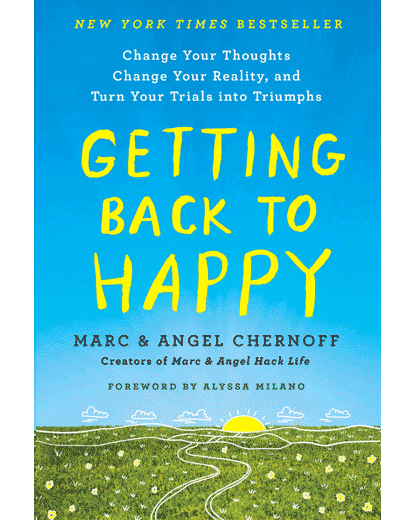 And of course, Angel and I are looking forward to showing you our brand new Getting Back to Happy course next week. Stand by for that. Excellent insight, as always. Looking forward to you new course, and more videos like this. It’s so true, the more we practice at something the better we will become, even if we are not absolutely naturally gifted at it. Also, those people that we assume are naturally gifted, just may be more persistent and self-disciplined than us. Thank you, this was so helpful and thought provoking. I laughed out loud at the part about alarm clocks because I hate them so much. But now I see how helpful they can be so I will start using one no matter how annoying the thought is. I wonder, do you have a podcast I can subscribe to? IF ONE CAN BE IMAGINATIVE IN ONE’S DEDICATION, IT MAKES IT EASIER TO SUCCEED.